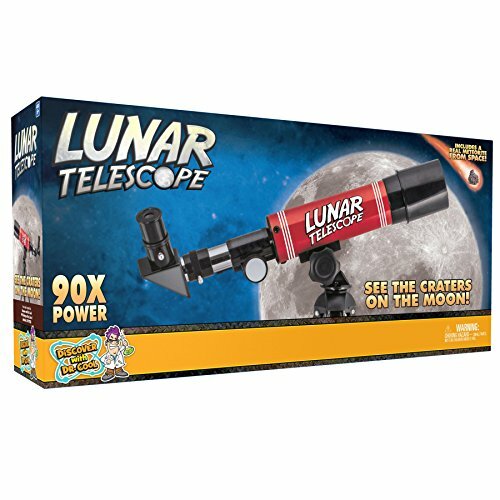 Explore the moon and its craters with this Lunar Telescope from Discover with Dr. Cool! This easy-to-use telescope is the perfect way to introduce your child to the wonders of space! Set-up takes less than 1 minute. The simple vertical and horizontal adjustments make exploring the moon’s crater a breeze. The included table-top tripod provides the perfect stabilization so that you can share your view of the moon with your friends. Includes 18X and 90X optical glass lenses for “wide-view” and “zoomed-in” views of the lunar surface. You’ll see craters on the moon in great detail with this lunar telescope. Boys and girls will love immersing themselves in the included adventure guide. The adventure guide, written by teachers, includes tons of interesting scientific facts about the moon and space, while the activity booklet reinforces this learning with 10 fun activities, puzzles, and challenges. We’ve also included a genuine meteorite specimen so that each child gets a small piece of space to add to their rock collection! Embark on your space exploration journey today! If you have any questions about this product by Discover with Dr. Cool, contact us by completing and submitting the form below. If you are looking for a specif part number, please include it with your message.